← The Blue Blubber jellyfish…. The largest known species of jellyfish is the Lion’s Mane Jellyfish (Cyanea capillata). It prefers cold waters of the ocean and is mainly found in the boreal waters of the Arctic, northern Pacific oceans and northern Atlantic. The Lion’s Mane found in the Arctic is one of the longest known animals and the largest recorded specimen is 120 feet in length and the bell body has a diameter of 7 feet and 6 inches. This was found washed ashore in Massachusetts Bay in 1870. 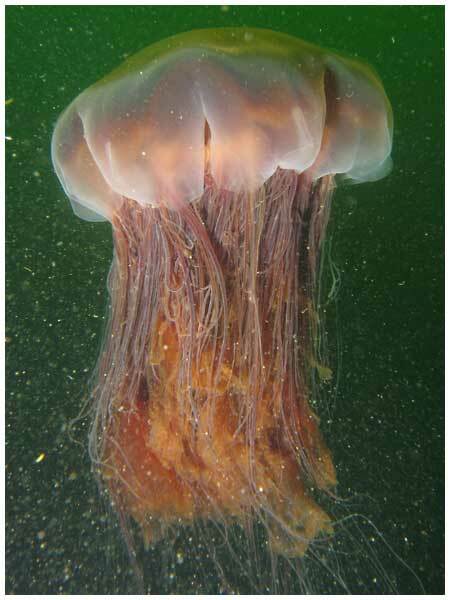 The Lion’s Mane is a common species of jellyfish and packs quite a sting. These stings are seldom fatal, but are toxic and can cause severe pain and burns. Only one person has been reported to have been killed by this type of jellyfish, but still this species is considered potentially dangerous. The bell body of this jellyfish is capable of attaining a diameter of 8 feet, but this species comes in varying sizes. The ones in the northern counterpart are much bigger in size then the ones found further south. The southern ones have only up to a bell diameter of 20 inches. The Lion’s Mane found in the northern oceans have tentacles which trail as long as 100 feet in length. The tentacles of this jellyfish is extremely sticky and come grouped in eight clusters. Every cluster has 65 to 150 tentacles, in a series of rows. The bell body has an appearance of an eight-pointed star, as it is divided into eight lobes.